How Does Psychic Ability Work? How does psychic ability work? Let’s begin at the beginning. I often compare psychic ability to the radio. The universe is like one big broadcast, and psychics work to tune into to the various radio station frequency. The farther away a particular broadcast is from the psychic (in terms of time, personal experience or understanding) the more difficult it is for the psychic to pick up the station. This of course, also largely depends on the quality of the radio. Some psychics have better receivers, just a like some radios… well, back in the pre-Pandora era of radios! Some radios offer better reception or sound quality. To some degree, this is why you tend to get what you pay for..whether it is a radio, or a psychic! However, some of the really expensive psychic readers might also be rip-offs. So, always choose your psychic with care. Fortunately, at Psychic Access you won’t have that problem, because not only are our psychics tested for accuracy and legitimacy, but we are limited in terms of how much we are allowed to charge clients. So, the radio concept is a decent analogy perhaps, but what does it really mean? How does t work? How do psychics get their ‘radio’ to tune in? The one word answer to this question is simple: consciousness. But what is consciousness? Consciousness is the material of intention that defines reality. In other words, consciousness is energy. For instance, consider the sandwich you had for lunch. Maybe it wasn’t even a good sandwich, but I guarantee you it was conscious. Yes, it was. Consciousness is, contrary to what some may think, not necessarily ‘alive’ by our standards. The sandwich you had was composed of matter – a specific combination of matter that allowed for it to be categorized as a sandwich. But the sandwich is a physical object, you say. True, but what I am speaking of is the energetic concept behind that physical manifestation of a sandwich. Before a sandwich can be a sandwich, the idea of it must exist. That is, if it were impossible to consciously perceive this thing we call a sandwich, then how would it exist? Think about it: if there was absolutely no concept of a sandwich, then there would no way for it to be! All reality exists within the capacities of perception or potential perception. Reality, is in fact merely perception. And all perception is consciousness receiving, and projecting itself. Before anything can be – you, me, or the sandwich – the concept of the thing must exist. And a concept is of an immaterial nature. It is an idea, a thought. In other words, it is consciousness. In this way, the conscious potential of anything is necessary in order for it to manifest in the physical dimension, or in any dimension, for that matter. The reason that consciousness is the precursor to physical existence is the same reason behind the validity of the Law of Attraction. As you are probably aware, the Law of Attraction illustrates how thoughts (consciousness) ultimately reveal themselves in terms of physical reality and our experiences as beings of the physical realm. This is because consciousness is the designer, the creator, of our experience. So, now that we can see how consciousness is energy, and energy is the stuff of universes, we can begin to address how psychic abilities work. Since everything is consciousness, everything and everyone operates not only from an individual vantage, but from a collective one. That is, the universe is possessing of one, great and infinite consciousness, within which is contained a forever number of individual points of consciousness – like you and me. You can think of these individual consciousnesses in terms of human beings in particular, as little neurons firing away inside of the great, big, universe brain. These little neurons connect to one another primarily in terms of their brain locale, aka, their dimension. In our case, that dimension is of a physical nature. These little neurons (humanity) do not usually notice that they are actually just parts of whole. They consider themselves singular wholes on their own, because from their perspective, that is how it seems. Any neuron possesses the ability, as a fiber of consciousness, to travel by circuitry to anywhere within the realm of the consciousness within which it operates—i.e. the universe. In this way, everything and everyone is psychic, or at least bares psychic potential. Those who we recognize as truly psychic, are those neurons that have figured out that they can fire across all the other neurons, in a particular sequence, in order to arrive at the neuron that pertains to the data they wish to gather. These ‘psychic neurons’ are highly connected, and they were probably made that way. Once they realize their potential, they also learn over time how their connecting powers operate, and develop and strengthen them throughout their lifetime. Consciousness is a vehicle to more consciousness. But how do we know where to look? How do we know how to get where we need to go? The answer is twofold. We need a connector, and at times we need to embody the perspective of the collective or whole consciousness. Let’s consider these two requirements of psychic function, in order to fully realize how these seemingly supernatural gifts navigate the infinite spectrum of universal energy. 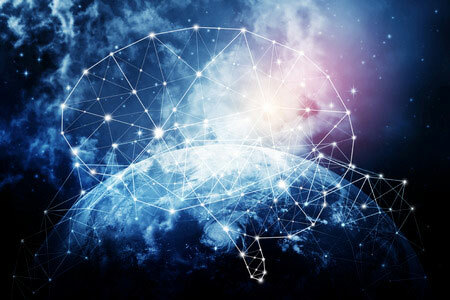 We can think of a connector as a pathway for our consciousness to navigate through the neural traffic of the universe, to a particular source of information. A connector can be anything that vibrates the energy of a person, event, or thing being psychically investigated: a name, an item, a birth date, or even a description. Connectors retain the energetic signature of the object of inquiry, and emit a specific vibration that leads the psychic to the object of inquiry, very much in the way that a scent leads a dog. Connectors can also be thought of as radio stations or frequencies that the psychic tunes into, in order to find the source they are in search of. If a psychic has a connector, they don’t need much else. But in order to translate what many call ‘spirit’ or the message from ‘source,’ the psychic can temporarily align themselves with the universal vibration. This brings us to the second imperative in psychic work – embodying the awareness of the collective – or speaking from spirit. When a psychic speaks from spirit, they translate an energetic message from a higher and more universal source. This typically happens when a psychic is required to do more than relay information regarding a specific object of inquiry. In such a case, they are prompted to communicate a message that an individual’s soul is in great need of receiving. This may be a message of validation, warning, encouragement, enlightenment, love, or revelation. Hopefully this article has helped you in some way to have a better grasp of how psychic abilities in general, and perhaps even how your own psychic abilities on a personal level, operate. Layna is a third-generation psychic, with abilities she inherited from both sides of her family. Currently she lives in Boulder, Colorado, but she has been serving clients professionally since she was twenty-one and has practiced in many places. For over thirteen years now, she's provided life-transforming guidance and has armed clients with the valuable information they need to decide their best course of action. She is also a talented astrologer and a clairvoyant empathic, who can accurately get into the heads of anyone and also predict the energies at play based on a client's natal astrological chart. Layna makes her mark wherever she goes because of her talents, and has built a successful practice because of the warmth, honesty and trust she creates in her environment. There is no off-the-clock with Layna. Once you're her client, her compassionate nature works overtime, sending you positive energy and prayers she would never charge you for! If you would like to sample her amazing psychic antenna, you can find Layna at PsychicAccess.com.